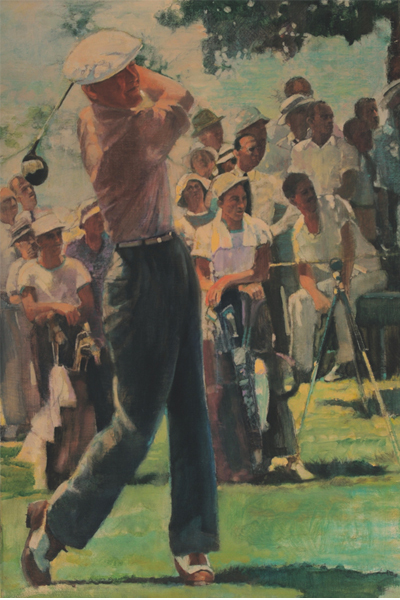 About Byron Nelson: I was commissioned by the publisher of Golf in America, Abrams to paint Byron for inclusion in this definitive history of the game in recognition of his being named Golfer of the Decade from 1940-1950. A review of his life and accomplishments below bears testimony the accomplishment of this great man and a truly remarkable golfer. From Wikipedia: John Byron Nelson, Jr. (February 4, 1912 – September 26, 2006) was an American PGA Tour golfer between 1935 and 1946. Nelson and two other well-known golfers of the time, Ben Hogan and Sam Snead were born within seven months of each other in 1912. Although he won many tournaments in the course of his relatively brief career, he is mostly remembered today for having won 11 consecutive tournaments and 18 total tournaments in 1945. He retired officially at the age of 34 to be a rancher, later becoming a commentator and lending his name to the HP Byron Nelson Championship, the first PGA Tour event to be named for a professional golfer. In 1974, Byron Nelson received the Bob Jones Award, the highest honor given by the United States Golf Association in recognition of distinguished sportsmanship in golf. When Nelson was 11 years old, the family moved to Fort, where he barely survived typhoid fever after losing nearly half his body weight to the disease, which also left him unable to sire children. Soon after his baptism at age 12, he started caddying at Glen Garden Country Club. On his caddying days, Nelson said, "I knew nothing about caddying at first, but it wasn't difficult to learn. The other caddies, though, didn't like to see any new ones, because that might mean they wouldn't get a job sometime. An article on Nelson in Sports Illustrated in noted that initially caddies were not permitted to play at the club: He would often practice in the dark, putting his white handkerchief over the hole so he could find it in the darkness." The club later changed its policy and sponsored the Glen Garden Caddy Tournament, where a 14-year-old Nelson beat fellow caddy and future golf great Ben Hogan by a single stroke after a nine-hole playoff. Nelson and Hogan were rivals but close friends in their teen years, and for the first part of their professional careers as well, but Nelson's early success was difficult for the struggling Hogan to deal with, and they gradually grew apart, while retaining mutual respect. After turning professional in 1932, Nelson served as a club professional in Texas, and played as many significant tournaments as he could afford, to develop his game. Money was tight, as Texas was hit very hard by the Great Depression. A pair of top-three finishes in important Texas events encouraged him. He then took a club professional's job at the Ridgewood Country Club in New Jersey in 1935. He worked hard on his game, having earlier realized that with the technological change from hickory to steel shafts, which was gathering momentum in the early 1930’s, that the golf swing would have to adapt as well. Nelson was among the first of a new generation of players who developed a full swing with increased leg drive leading the downswing; this is the forerunner of modern golf technique as practiced by top players, right to the present day. Nelson is sometimes credited as being the father of the modern golf swing. He refined the changes for a couple of years, and then took his game to the highest level of competition, the PGA Tour. Nelson waited until 1935 to post his first significant victory, at the New Jersey State Open. He followed this up with a win at the Metropolitan Open the following year. He reportedly won this tournament with "$5 in my pocket"
Nelson won his first major title at The Masters in 1937, two shots ahead of runner-up Ralph Guldahl. During this tournament he shot a first-round 66, which was the lowest first round score at the Masters until 1976, when Raymond Floyd had 65 en route to his victory. Nelson won four more majors, the U.S. Open in 1939, the PGA Championship in 1940, and 1945, and a second Masters in 1942. In his career, Nelson won 52 professional events, and, along with Harold “Jug” McSpaden was one of the “Gold Dust Twins.” Nelson won the Vardon Trophy in 1939. He played on two Ryder Cup Teams in 1937 and1947, and was non-playing captain in 1965. After 1946, Nelson curtailed his schedule, although he continued to make regular appearances at The Masters as a competitor, played occasional Tour events, appeared in a few overseas tournaments, and later served as a ceremonial starter for many years. In 1945 Nelson enjoyed a record-breaking year, winning 18 of 35 PGA tournaments including 11 in a row. Both records are still yet to be beaten. Nelson however lost many chances at major championships during this year, and previous years, because of the war, and only won the 1945 PGA Championship. There has been debate to how impressive these results are, as it was believed to be a weakened tour due to the war. But in reality many of the leading golfers of that time, including Sam Snead and Ben Hogan still played a full or at least part schedule that year. Both Snead and Hogan won multiple times on the tour in 1945. During this year Nelson finished second another 7 times, set a record for the scoring average (68.33 for 18 holes) that was broken by Tiger Woods in 2000, in 2000, a record 18 hole score (62), and a record 72-hole score (259, which beat the previous record set by Ben Hogan earlier that year). This year is now known as the greatest single year by a player on the PGA Tour, as Arnold Palmer said: "I don't think that anyone will ever exceed the things that Byron did by winning 11 tournaments in a row in one year." Even more recently, Tiger Woods referred to the year as "one of the greatest years in the history of the sport." Nelson's record of 113 consecutive cuts made is second only to Tiger Woods 142. The PGA Tour defines a "cut" as receiving a paycheck, even if an event has no cut per se. In Nelson's era, only the top 20 in a tournament received a check. In reality, Nelson's "113 consecutive cuts made" are representative of his unequaled 113 consecutive top 20 tournament finishes.